A scientific review of research on the transportation of horses concluded: “Although some horses adapt to transport much better than others, transport is generally associated with lower reproductive rates, increased disease incidence, a temporary reduction in athletic performance and the alteration of many other physiological traits that are indicative of stress... Transported horses can be subjected to a wide range of potential stressors, including isolation from herd-mates, forced close proximity to unfamiliar or aggressive horses, novel or threatening surroundings, exposure to new pathogens, restraint of normal activity patterns, forced adoption of an abnormal posture, extremes in temperature, water and feed deprivation, and blowing dust and particulate matter. Transport has long been associated with morbidity in horses” 10. 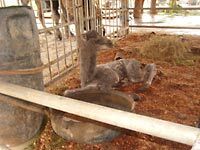 Alpacas and other camelids, who traveled for just 30 minutes, suffered from a resulting potentially dangerous hormone disorder called hypercortisolemia (Cushings syndrome). When the trip ended at a location familiar to the animals it still took four hours for their cortisol hormone levels to return to normal 11. Circus animals are often transported for longer periods and, unlike these alpacas, transported to unfamiliar locations. Tigers in circuses show a wide range of abnormal behaviors and coping strategies while traveling. One of the most common stereotypic behaviors is pacing. In one study pacing increased as travel time increased [6, 9]. A study of captive black rhinoceroses demonstrated a connection between transport and the immediate development of a skin disease . Many species are known to suffer from capture myopathy, a syndrome that occurs in wild mammals and birds, whether free-ranging or captive, associated with the stress of capture, restraint and transportation. In many animals the syndrome is characterized by clinical depression, muscular stiffness, lack of coordination, paralysis, metabolic acidosis and death 13. There are numerous studies on the effects of transportation on horses and other animals used in agriculture. This data also applies to animals in traveling circuses. Substantial evidence has shown that horses suffer during transportation. Equine expert and veterinary behaviorist Dr. Paul McGreevy discusses transportation of horses 14. "Horses brace themselves against and in anticipation of the changes in momentum during road transport by adopting certain body postures (notably the base wide stance). Efforts expended by horses as they continually adjust their posture during transit reflect both muscular and emotional stress related to road conditions and the drivers behavior. All of these efforts are readily evaluated by monitoring heart rates during transport. Horses have been shown to have higher heart rates in a moving vehicle than in a stationary vehicle, and although heart rates decreased significantly during a road journey, they did not return to resting levels. Transport stress may increase susceptibility to diseases, including an equine herpes virus and salmonellosis infections". A study of the effects of a 24-hour transport in horses showed that “Plasma cortisol concentration increased during loading and the first 3 hours of transport and continued to rise throughout the 24 hours, to peak at the termination of transport... after the stressor [i.e., transportation] ceased, cortisol dramatically declined” . Many studies show that transport induces weight loss in some animals. Immediately following transit in one study, horses showed a 6 percent weight loss. The investigators thought this could be due to “heat dissipation, sweat loss, and decreased gut fill during transit,” but there was still a 3 percent weight loss 24 hours after the transportation period 15. The immune systems of horses are compromised by the effects of transportation. Stull and Rodiek 15 concluded that this could result in increased susceptibility to infectious diseases. A similar study by Stull et al 16 found elevations in cortisol concentration, white blood cell count, and other physiological changes, which led to the same conclusion. It also acknowledges that “a small window of immunological uncertainty follows long-term transportation, enhancing the potential risk of infectious disease in susceptible individuals." Aggression among horses increases during transportation, especially when many horses are transported together . About 20 percent of all horses receive some type of injury during transportation, most of which occurs to the head and face 18, 19. Another paper reports “many incidences of aggressive horses repeatedly biting an adjacent horse in an apparent effort to get the horse to move away” 17. Transport is thought to be one of the most potent stressors for cattle 20. Stressors involved in the transportation of cattle result in altered nutritional status and animal behavior, reduced body weight gain, feed consumption, immune function and increased mortality . Long-term transportation in cattle has been found to increase the secretion of ACTH (adrenocorticotropin hormone), a regulator of immune responsiveness, and therefore to exert a negative effect on the immune system. When cattle are rested and fed on their truck when it is stationary, their ACTH levels remain high, coming down only when they are removed from their truck and rested and fed in stalls for 24 hours . Transport stress induces an increase in thyroid and adrenal activity in cattle that is evident even after a short trip and continues to increase after long-distance transport 20. Long-term transportation in cattle results in an increase in heart rate and body temperature 22. Transport compromises the welfare of sheep. Some studies have found experiences associated with loading to be particularly stressful to sheep. There was an increase in the core temperature of sheep after 2.5 hours of road transport 23. Sheep showed heart rate and cortisol increases in response to transport 24,25, 26. Pregnant horses transported for nine hours showed signs of prolonged stress associated with abortion or reabsorption of early pregnancies, signaled by a change in the concentration of ascorbic acid in plasma and tissue 27. The study also showed that transportation caused increases in serum progesterone and cortisol, which are also indicators of stress. Thirty mares were tested daily throughout one normal estrous cycle. There was an increase in LH concentrations in transported mares (LH is luteinizing hormone, which regulates the release of progesterone and estrogen) and an increase in cortisol and concentrations of plasma ascorbic acid. The paper concludes that the 12-hour transportation of mares induces “hormonal and plasma ascorbic acid responses indicative of stress” . While it is a common view that horses and other animals become accustomed to transport, we have not seen any scientific evidence of this. Just because an animal undergoes an experience repeatedly does not make the experience less traumatic. It may in fact make the animal more sensitive to the trauma, and it might be more difficult to identify this. Many of the scientific papers we have reviewed describe the effects of a single journey, but since circus animals must endure multiple and frequent journeys, at least some of these effects will be multiplied. Poor animal care practice in the circus may not always be intentional, but it is basically unavoidable, given the mobile nature of circuses and the temporary enclosures, living spaces and trailers that the animals must inhabit. Even reptiles, which are extremely difficult to care for due to their highly specialized needs such as specific temperature and light requirements, are currently legal in circuses. The constant moving and the changing environmental conditions cause disruption of normal behavioral patterns, which are likely to leave animals vulnerable to stress and disease. For example, McGreevy14 describes how the timing of sleep is very important in horses. Horses prefer to sleep in the early afternoon, so there should be a minimum of activity at this time. However, in the circus, transport, training and performances do not take this into account. Enclosures with a restricted amount of space can create a stressful environment for an animal. When animals are housed in groups, the space restrictions can precipitate increased aggression between individuals, where lower ranking animals cannot escape, and more injuries occur through fighting . It is widely accepted by the zoo industry that environmental enrichment the process of improving or enhancing animal environments and care within the context of the animals behavioral biology, i.e., keeping the animals as close as possible to their natural environments30 is essential to the welfare of captive animals. Environmental enrichment is a dynamic process, requiring speciesspecific modifications, which circuses cannot provide in a meaningful way. The high level of abnormal behavior observed in circus animals testifies to the absence of useful environmental stimulation . Elephants are the largest mammals walking the earth. In the wild they travel up to 13 miles a day, eating a variety of foods, bathing, enjoying a close-knit family life with complex social interactions. As these herds move, they transform the landscape, helping the regeneration of their natural environment. Yet in the circus, these intelligent, social beings are commonly shackled to the ground by one front and one rear leg in order to control them. They can barely take a step or two, forwards and backwards, and cannot exhibit most of their typical behaviors. It also restricts social interactions, because contact is limited to the elephant shackled next to them31. Although many circuses now claim to give their elephants regular access to a pen or outdoor enclosure, the elephants free time is limited when the circus is constantly on the move, and the elephants have to be prepared for their performances each day. At night, elephants are commonly chained from the time the workers finish their day to when they arrive the next day. This can mean over half the elephants time is spent chained to a stake in the ground or inside a truck . Even when elephants are left free in exercise enclosures, these are too small. Consequently, stereotypies occur in captive elephants, regardless of the system of animal care used. One study of circus elephants found that, “Weaving was the most common stereotypic behavior in the elephants, regardless of whether they were picketed [chained] or penned” 32. Another study which saw stereotypic behaviors in all the elephants observed, concluded that “the welfare of closely confined elephants can be poor” 33. High levels of stereotypic and abnormal behaviors were observed in all the elephants involved in the Kirkden and Broom study, which was undertaken in a circus holding facility. This study described how stereotypic behavior differs between individuals and that changing the methods of animal care practices (i.e. shackling versus unshackling), only reduces stereotypies in some individuals. For some elephants it was impossible to identify one underlying cause of stereotypy. Many aspects of the circus environment were found to cause stereotypic behaviors in elephants, such as the lack of social contact, anticipation of food or another significant predictable event, the presence or absence of people, the size of their enclosure, and their proximity to other specific individual elephants. It was also noted that in addition to stereotypies, some circus elephants show other types of abnormal behaviors, such as prolonged inactivity, probably as a result of being confined in an unstimulating environment . ADI observation data and videotapes document stereotypic behaviors in all circus animal species we have studied. In the wild, browsing and grazing animals spend a large part of their day eating. Circuses cannot provide permanent outdoor paddocks for grazing so these animals spend much of their time confined to indoor stalls or tied to trailers. ADI has found that even when outdoor paddocks are provided, they can be on concrete, asphalt or whatever surface is available. Sites tend to prioritize audience accessibility and needs rather than cater to animals. This severely restricts the ability of these specialized animals to carry out their natural feeding behaviors. In the wild, giraffes use their tongues to remove tree leaves and avoid thorns. The absence of this specific challenge in captivity creates a behavioral vacuum and the resultant frustration can cause oral stereotypic behaviors, such as excessive licking, bar biting and tongue playing34. The number of hours an animal is housed indoors can be used to predict the occurrence of stereotypic licking behaviors in browsing and grazing species34. A frustrated feeding motivation may also result in motion stereotypies, such as pacing34. Indoor enclosures mean less variety of stimulation than outdoor enclosures, conditions that are very important for reducing the occurrence of stereotypic behaviors in general . Farmed deer housed indoors during winter exhibit higher levels of aggression, resulting in more injuries to each other, than deer who are confined outdoors in a field. Indoor deer also show an increase in behaviors like chewing each other and their enclosure . Dama gazelles, particularly the dominant individuals, show more aggression towards their herd-mates when housed in smaller enclosures29. A survey of 257 zoo-housed giraffes and okapis found that almost 80 percent of the animals showed at least one form of stereotypy34. Males are affected by a limited enclosure area and by odors, such as a chlorine disinfectant. Another study found that captive black rhinoceroses appear predisposed to a skin disease not found in wild black rhinos. This disease was linked to periods of physical or environmental stress, such as capture, transport, sudden cold or the introduction of a new rhino12. It was also suggested that the unvaried diet of captive rhinos, compared to that of their wild counterparts may play a role in the development of this disease (in the wild rhinos have been observed to browse more than 200 species of plants). These studies of browsing and grazing animals demonstrate the complexity of captive animals needs and confirm that traveling circuses simply cannot address those needs. ADI has recorded evidence of aggression in horses during transport and in stable tents. Some animals who are considered difficult or aggressive, like stallions, are not allowed into enclosures and therefore get even less exercise. The scientific literature shows that carnivores, especially members of the cat family and bears, suffer from captivity. This evidence comes mostly from zoos, where the animals have a permanent residence. Most modern zoos now try to create a habitat as close to the animals natural environment as possible. The temporary nature of the accommodations in traveling circuses makes it impossible to provide the animals with a suitable environment. Therefore, any negative effects of captivity in zoos will be worse in circuses. When the cats were moved between facilities for breeding programs, eight of the fifteen animals suffered an increase in corticoid concentration, and six exhibited a prolonged stress response. Of the seven animals who did not experience an increase in corticoid concentration, four had a single peak immediately after movement. The authors concluded that transporting the cheetahs caused the stress response. Corticoid responses increased when the cats were put on public display, and they decreased away from public view, thus indicating a negative welfare response to such exposure . Carnivores frequently show stereotypic behaviors, such as pacing, in captivity. A study38 looked at nine species of cats in eleven different enclosures at the Edinburgh Zoo. It found that “stereotypic pacing was recorded at various levels in 15 out of 19 cats (79 percent), the levels varying between 1 percent and 32 percent of scans.” The complexity of the animals enclosure was thought to play a big role in the incidence of such behaviors. A study of leopards39 found that relocating cats to new cages provoked an initial increase in adrenocortical activity and increased hiding behavior. The cats failed to adapt to a new environment. Captive clouded leopards showed several signs of distress or poor well-being: a high number of stereotypic behaviors, apathy, self-mutilation (e.g., fur plucking and tail chewing), and intersexual aggression (i.e., mate injury and mate killing). They also achieved poor breeding success and experienced other health problems . Nonhuman primates are our closest relatives. They are highly intelligent and live in close family groups. They suffer in captivity, just as we would. Most nonhuman primate species share more than 90% of their DNA with humans (Homo sapiens)53. The chimpanzee (Pan troglodytes) DNA sequence differs from ours by 1-1.5% [54, 55]. Recent studies have revealed that 99.4 % of the bases are identical within the same genes in humans and chimpanzees. It has therefore been suggested that chimpanzees should take their place alongside humans within the genus Homo56. The primate species vary in size by several orders of magnitude, and are adapted to widely different ways of life mainly in the tropics57. Perhaps the most striking feature of all primates is their high intelligence. Cotton-top tamarins can solve tasks that require the use of one object to attain another, for example the use of a tool to obtain food. Without training, they can discriminate between tools of different colour, texture, shape and material, in terms of their ability to retrieve food58. Wild chimpanzees have been observed creating tools in order to feed on termites. Rhesus macaques can perform rudimentary arithmetic and think using symbols. Considered paramount among human cognitive abilities is the capacity to reason about what others think, want and see; a capacity referred to as ‘theory of mind’. Rhesus macaques have been shown to possess an essential component of theory of mind the ability to deduce what others perceive on the basis of where they are looking61. Chimpanzees show cross modal transfer of information in that they can, for example, recognize by touch alone objects that they have previously only seen, and can understand and use abstract symbols in their communication62. Humans and chimpanzees differ in intellectual ability, but what differs is their degree of intelligence, not the kind of mental processes employed. There is no bold line separating human intelligence from chimpanzee intelligence. Chimpanzees have even learned and then taught other chimpanzees American sign language (Fouts). Captivity affects different animal species in very different ways. There is however consensus among researchers regarding the higher risks of suffering for the species with more intelligence and cognitive abilities63. It is clear that the impoverished environment and lack of stimulation in the traveling circus seriously compromises the welfare of these animals. These are species for whom social contact with their own kind is a vital component of any environment. As primates ourselves it should be easy for us to comprehend the impact of social isolation or limited social contact on these species, since their social behaviors so often reflect elements of our own. Chimpanzees display a range of postures and gestures similar to those of humans in similar situations. They greet with kisses and embraces, they play and reassure each other and express emotions including anger and sadness, they seek reassurance and comfort like humans. They hold hands, pat each other on the back, swagger, and shake their fists, tickle and laugh. Not only that, but they do so in the same kind of context as ourselves. There are similarities amongst other primates. For example during courtship capuchin monkeys use many of the same behaviors that humans do, such as gazing into each others eyes, tilting their heads, raising their foreheads and blinking their eyes64.We primates are social. The macaque social system is based on specific rules for relationships and socialbehavior and rhesus macaques develop long-lasting social bonds that may endure a lifetime65. Capuchin monkeys work together to gather food and then share the fruits of their labour, the kind of cooperation essential to human society60. We nurture and teach our children over a long period. Peer play is important in the development of young rhesus macaque monkeys because it promotes social development. During play, chimpanzees learn about nonverbal and other forms of communication66. Juvenile vervet monkeys display exploratory behavior (such as playing with a new toy) which is common to both vervets and humans53. Nonhuman primates have been found to be susceptible to various forms of stress, which might cause changes in behavior (e.g. social behavior, stereotypic behavior) and hormone concentrations (e.g. the corticosteroid level)67. Stress may be psychological as well as physical68. There is a clear danger of circus primates adopting stereotypic and abnormal behavior. Such behavior among primates has been observed in zoos, and has been attributed to a variety of factors69. For chimpanzees, socially deprived individuals (e.g. those that were separated from their mothers at an early age) show reduced levels of normal behaviors and a higher level of abnormal behavior, as well as a wider range of abnormal behaviors. A study into stereotypic behavior among primates in captivity found that the animals with the most marked stereotypic behavior were those that had been hand-reared by humans. The authors also found that animals that had been confiscated from touring zoos, circuses and animal traders exhibited higher levels of abnormal behaviors than did animals reared in larger, recognized zoos71. Hand rearing is popular amongst most performing animal establishments because it teaches reliance and compliance at an early age, and infant animals are popular with audiences and for photo opportunities. Logically there will be negative behavioral impacts from continually removing young animals from their mothers. The demands of continual transport and readjustment appear to have been directly related to abnormal primate behavior, which itself usually indicates that the animal’s psychological welfare is at a suboptimal level. Performing animal handlers require regular one-to-one contact with young primates to maintain control, dependence and obedience. The handler becomes the only source of food, water, and approval. Thus, trainers deprive performing primates of normal social contact with their own kind, locking them into a lonely world where food, water, and affection are handed out as a prize for compliance. The chimpanzees smile which you so often see is, in reality, a grimace of fear. It is a sad irony that it is our empathy for these creatures that is being exploited by the cynical trainer. Circuses include many domestic animals, such as common pet parakeets (budgerigars), cats, dogs and horses, in their acts. Although there are few scientific studies on household pets that would apply to the circus situation, these animals are subject to many of the same problems as exotic species. Dogs have an inherent desire for social contact and are not suited to being confined alone in cages or kennels. Housing dogs alone results in boredom, under-stimulation and behavior problems. Visual and tactile contact with other dogs improves a dogs psychological well-being and alters negative behavior patterns41. Both domestic horses and captive exotic equids, such as zebras and Przewalski horses (native to Mongolia), show a variety of stereotypic behaviors when stabled or confined, including, crib-biting, wind-sucking, wood-chewing, weaving, pawing, trailer and door-kicking, self-biting and head tossing14. Domestic cats may show increased hiding behaviors as a response to stimuli or changes in their environment and to avoid interactions with other cats or people. They are more likely to respond to poor environmental conditions by becoming inactive and by inhibiting normal behaviors, such as self-maintenance (feeding, grooming and elimination), exploration, or play, than by exhibiting abnormal behavior. To summarize, the fact that an animal is of a domesticated species does not mean that it will suffer less when confined for long periods of time to a small space or in a box. Broom & Johnson: “...neither early training nor genetic selection can push the individual beyond its biological potential and a profound lack of stimulation is something to which no vertebrate animal is likely to be able to adapt” . It is vitally important to house species in appropriate groups. For many species social living provides more benefits than finding food or avoiding predation. It is a major source of stimulation and life enrichment. The social environment of many species represents a constant source of mental stimulation, the complexity and variety of which animal keepers cannot replace by any form of artificial environmental enrichment. Social species, such as elephants, are often kept in isolation, while animals who are naturally solitary, such as tigers, are commonly kept in groups. Animals in circuses can experience different types of separation separation from their own kind (especially problematic for social species) and separation from companions who may or may not be of the same species. The detrimental effects of social deprivation and separation have been widely documented in many species and are known to cause behavioral and physiological indications of stress. In a study of social separation in giraffes, a male was removed from his two female companions. The females displayed protest behaviors, including increased activity, stereotypical behaviors, and increased contact with each other. They also showed decreased habitat utilization. These results were consistent with the findings of studies of other species, particularly nonhuman primates, where the first change in behavior is protest, characterized by increased vocalization, motion and stereotypical behavior, as well contact and clinging if the animal is housed with peers during the separation. Giraffes are not known to be highly social animals in the wild, yet their aversion to this kind of social separation proves that a complex social structure is not a prerequisite for social attachment. Spectacled bears have been documented displaying stereotypic repetitive head-tossing as a result of social frustration when they were prevented from interacting with other bears who were in close proximity to them44. In the wild, elephants live in groups and display complex social behavior. The natural grouping of both African and Asian elephants is of a family unit, and the social bonds among the members of the family are very strong45. Such family units are not possible in circuses, where elephant groupings are varied and changeable. Supporting this, a study on circus elephants found that the limited opportunity for social contact was the principle factor in the female Asian elephants stereotypy. Piglets isolated from others showed increased sitting, pawing behavior and escape attempts and decreased activity, play and interest in novel objects. All these changes reflected negative impacts on the piglets welfare46. Social separation in cattle induced struggling and large increases in vocalization, heart rate and plasma cortisol concentrations. The mere presence of other cattle was sufficient to prevent struggling and vocalization, regardless of peer identity, which shows that nonspecific attachments can develop between individual cows and their peers. Tigers in the wild are solitary animals, coming together only for mating. A study on circus tigers described how circuses often transport tigers in groups and that severe fights can break out6. Major movement in the back of a truck could be felt by a driver, indicating fighting. Whenever this happened, the method of stopping the fight was the sudden application of the brakes, which would cause the fight to stop until the truck could be stopped, and a handler could separate the tigers. Clearly an unacceptable situation. Studies of browsing and grazing species have shown that increased social density may produce competition for resources, especially food, which could then increase the likelihood of stereotypic licking. When next to cattle or pigs, farmed red deer stayed as far as possible from them and were generally more active, showed agonistic interactions and had elevated plasma cortisol concentrations. Despite previous familiarization of some of the deer with cattle, the more experienced animals did not habituate to the unusual grouping. In fact, evidence suggested that previous exposure to cattle e red deer more aversive to them. Like other browsing and grazing species, deer have evolved a naturally exaggerated flight distance as an adaptation for escape from predators. In a confined space, where they are housed close to other species, they cannot prevent these other animals from entering their flight zone. Obviously, ruminants and omnivores like cows and pigs do not pose a predatory threat to deer, but they may pose other threats. Firstly, they are not familiar to deer and are thus perceived as a potential threat. Secondly, they may be competition for resources. Thirdly, different species have evolved specialized means of communicating with one another, and the unpredictable noises from another species and an inability to read each others signals may cause problems in mixed species groups48. Prey species have adapted to recognize, avoid and defend against predators49. However, in the restrictions of a traveling circus, animals such as horses, other browsing and grazing animals and smaller animals are frequently exposed to one or more predators, such as dogs, tigers, lions and bears. Predators may also become stressed and frustrated by the presence of prey species they are unable to hunt or of competing predators, with whom they cannot compete. Studies of mammalian changes in behavior when exposed to predators have shown responses such as anxiety and long-lasting neural circuit changes in the brain. For many mammalian species, predator avoidance relies on sensitivity to predator odors. Research on the effect of predator odors in mammalian prey species describes how pregnant female rodents exposed to such odors may give birth to smaller litters and exposure to such odors in early life can also hinder normal development. Studies of mammalian species who avoid predator odors includes rodents, possums and sheep. Behavioral effects in animals exposed to predator odors include inhibited activity, suppression of nondefensive behaviors, such as foraging, feeding and grooming, and shifts to habitats or secure locations where such odors are not present49. Even closely related animals, such as different species of exotic cats, can be averse to the presence of other species. A zoo study investigating the low reproductive success rate of small exotic cats in captivity pointed out that most ofthese cats are solitary in nature. However, in captivity they are routinely housed in pairs and managed in close proximity to other species of small and larger cats, whom they may perceive as potential predators or competitors for resources and territory. Cats try to avoid contact with other cats and show abnormal and stress behaviors when other cats encroach on their territory. This was cited as a possible reason for the lack of breeding success with this species in captivity. Inadequate animal care practices and limitations of space make it impossible for animals to express normal behavior. This leads to a high number of stereotypies and other abnormal behaviors, increased aggression towards other animals, increased susceptibility to disease, the presence of physiological indicators of stress and greater mortality. Isolation or separation from companions leads to complex changes in behavior, including a decreased interest in surroundings, stereotypies, increased heart rate, vocalizations and higher levels of physiological stress. When predators are in close proximity to prey, the prey shows anxiety behaviors, changes in their nervous systems, a suppression of feeding and grooming behaviors and often a lowered breeding success. When they do breed, the presence of a predators odor can lead to smaller litter sizes and can hinder the normal development of young. The horse data helps us to assess the effects of constant confinement, transport and performing on a whole range of other animals. Horses have a long-established relationship with humans, but there is clear evidence of the suffering of horses in all aspects of circus life. How much more, then, must other species, especially those instinctively afraid of humans, suffer? Given the circumstances, it is simply not possible for traveling circuses to provide animals with the space and environment they need to maintain optimum physical and psychological health. The abnormal behaviors seen in animals justify a call for an end to the use of animals in traveling circuses. If there is doubt about the identification of injury or poor animal welfare, the animals should be given the benefit of the doubt.